CHARLOTTESVILLE, Va. — Siena Hart and her family spent the weekend unpacking five carloads of clothing, school supplies and dorm necessities at the University of Virginia, where she’s a proud incoming member of the Class of 2021. Yet the Richmond native never imagined that her “dream school”—founded by Thomas Jefferson in 1819 and built in part using the labor of enslaved African Americans—would garner national and international headlines for an onslaught of hateful incidents. On Friday, August 11, so-called 'alt-right’ groups comprised of white supremacists, neo-Nazis, KKK members, skinheads and other groups invaded UVA’s campus, brandishing lit torches and chanting such slurs as “Jews will not replace us!” The men who marched numbered in the hundreds. The following day, another “Unite the Right” rally in downtown Charlotte turned violent, then deadly after a car plowed through a group of counter-protesters. Heather Heyer, a 32-year-old Charlottesville activist was killed, while another 19 people were injured. After the tears, came worry: she knew that dropping her eldest daughter off at college would be emotional, but recent events at her alma mater—where there are some 35,000 students, faculty and staff—have added a whole new layer of angst. Joseph French, 20, a third year student of Latino descent, was in a dorm room watching Netflix when the “frightening” scene suddenly unfolded. "Some students went out there and were met with pepper spray and hit by torches. They were very brave." 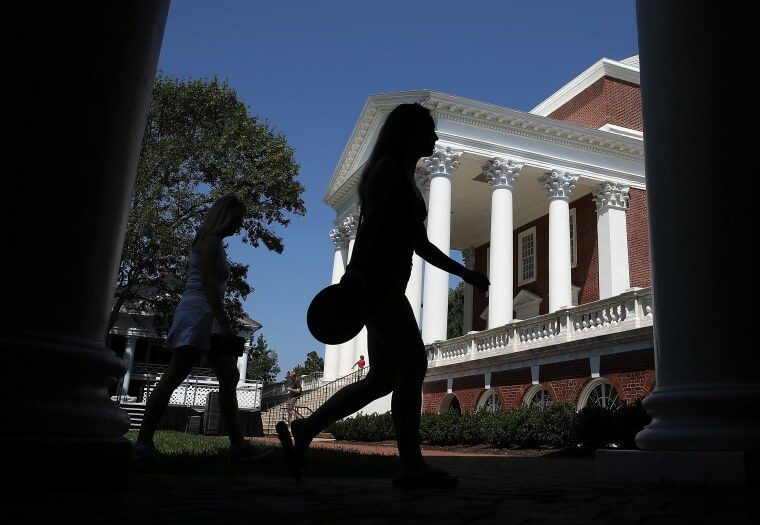 UVA has released public statements noting that administrators have held meetings with select students, various officials, and is in the process of reviewing security procedures, among other actions. “While no public space or environment can be completely safe all of the time, the university will continue pursuing that goal as a top priority,” Sullivan’s statement said. According to information on the university's website, there were more than 36,000 applications for approximately 3,700 slots in the Class of 2021. The class includes more than 1,200 students who identify as members of a minority group. About 56 percent are women. This past weekend, African American UVA alumni from around the country met some of these students of color. They descended on campus during move in weekend, lending a hand with boxes and trunks, while aiming to boost student morale and spread goodwill. Led by Washington, Gregory Jackson and other leaders, the alums have formed a new group called #HoosAgainstHate, a take on the school’s nickname, “Wahoos.” Sporting black T-shirts bearing their logo, the alumni members orchestrated a full weekend of events on campus, where they socialized, strategized and performed acts of service. Hoos Against Hate is planning a letter writing campaign and phone calls to support, encourage, and motivate students of color. They want to build support for a #TakeDownHate social media awareness Campaign to have individuals share their personal stories in support of taking down Confederate statues they believe incite violence, hatred and conflict. Future actions, they say, will include coordinating vigils and peaceful marches across the nation. Moreover, UVA student leaders and faculty have ideas about the path the university should pursue in order to move forward. Lisa Woolfolk, Ph.D. is an Associate Professor in UVA’s English Department. She’s been at the university for 17 years. For instance, she believes the city should remove all of its Confederate monuments. She’d also like to see city officials “commit resources” to dismantling what she described as a longstanding culture of white supremacy. For instance, the school can continue “to tell a more complete story of the university and slavery,” and work to pay a living wage for all employees. “We can assess how white supremacy emerges in all aspects of University life including curriculum, faculty appointment, admissions, student life, and more,” said Woolfolk. The organization is planning a vigil on Monday night at 9 p.m. The plan is for students to march from Nameless Field to the statue of Jefferson at the Rotunda. The goal is to “reclaim our grounds,” said Gobar. Inside her dorm, Hart hugged her mother and relatives and prepared to begin her new independent life as a college student. She spoke of her studies—“I’ll pursue a Pre-Med track”—and her dreams of possibly becoming a neurosurgeon. She’s determined not to let the events on campus and off derail her academic and social plans.